Manufacturing, Trading, Importer and Exporter of Detergent Polymer and Chemical Products. 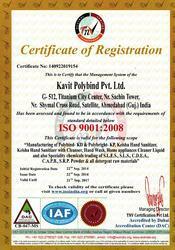 Integrated in the year 1996, at Ahmedabad (Gujarat, India), we, “Kavit Polybind Pvt. Ltd.”, are known as the reputed manufacturer, importer, exporter and trader of optimum quality Detergent Polymer, Chemical Supplies and Hand Cleanser With Sanitizer. These are products are precisely processed using higher quality basic ingredients, chemical compounds and advance technology. At our sophisticated manufacturing unit, the offered range is precisely processed in compliance with the set universal quality norms. Our offered products have achieved huge accolades all across the market for their features such as longer shelf life, high purity, effectiveness and precise composition. Apart from this, our products are available in assorted packaging options and other related stipulations as per the varied needs of our esteemed customers. To perfectly meet the varied needs of clients, we have built a huge infrastructural base that is fitted with all the required sophisticated machinery & equipment. This “state of art” infrastructure is divided into assorted departments such as production, quality testing, R&D and sales & marketing, etc. All our departments work in close-coordination with each other in order to offer clients the best quality products. Further, these departments are maintained as per the latest market advancements in order to manufacture the world-class range of products. Highly developed infrastructure & sophisticated machinery endows us to accomplish the bulk orders of customers within the specified time period. We have recruited highly qualified experts by analyzing their skill & knowledge in the concerned area. Our team works with full dedication to carry out entire business procedures in a systematic manner. Further, we conduct skill enhancement programs at regular interval to keep our professionals informed with the changing market trends prevailing in the market. As a quality conscious company, our main aim is to offer splendid quality products to the customers. The entire product range is stringently checked on assorted measures at our quality testing unit in order to deliver flawless collection at customers’ premises. Further, to attain the best level of contentment of customers and to make customers for life, we rigorously follow qualitative way. We trust in making fruitful relation to achieving complete clients’ satisfaction. Apart from this, our followed client centric approach, fair business practices, timely delivery of products and wide distribution network has also aided us in providing the satisfaction to our cherished patrons. Under the management of our Managing Director, “Mr. Tapan Shah”, we have achieved a reputed place in the market. His unperturbed focus towards the accomplishment of the organizational motives has attained us to the epitome of success among other industry competitors. We are the well-known manufacturer and trader of high-quality Detergent Polymer, Chemical Supplies and Hand Cleanser With Sanitizer. On account of our well-developed infrastructure and a team proficient professional, we are offering clients the flawless range of products. We deal in the brand Keisha. We import & export all over the world except Pakistan. We have a team of sincere, hard-working and dedicated professionals, which is the strength of our company. Our personnel have detailed knowledge and have years of experience in their working domain. The team of our professionals is very enthusiastic in comprehending what our customers want from us and put in all their attempts to offer the products accordingly. Apart from this, our skilled professionals process the products in complete compliance with the set industry norms. Infrastructure plays an important role in manufacturing excellent quality products; we have established a sophisticated infrastructure unit that is spread over a wide area. Our infrastructure is further categorized into various units like production, quality testing, R & D, sales, and marketing, etc. The infrastructure base is outfitted with entire latest machines & equipment assists us to enhance the production procedure rate. The divided sections of our infrastructure help us in accomplishing and offering bulk & urgent shipments of patrons in a timely manner.